Bed Room Walls and Ceiling. 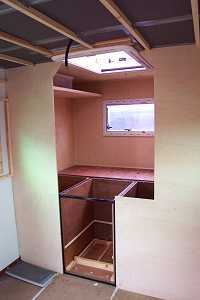 My Unimog campervan has a permanent sleeping area about 2100mm long by 1400mm wide by 1200mm high over the rear lockers. 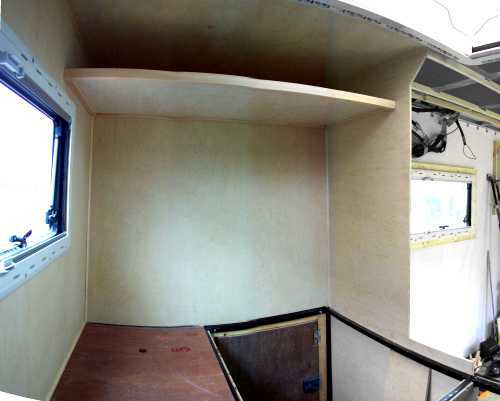 The walls of this area (14mm GRP coated Ply) were insulated with sheets of 30mm X-trem between 27 x 32mm battens attached to the walls with Sikaflex 221 adhesive at about 300mm centers. I considered lining this area with thin MDF, carpet, and fabric coated hardboard, but eventually settled on 1.5mm plywood. This has the advantage of being easy to cut with a craft knife, very strong, very light and easily finished with polyurethane or paint. It's only disadvantage being it's high cost. 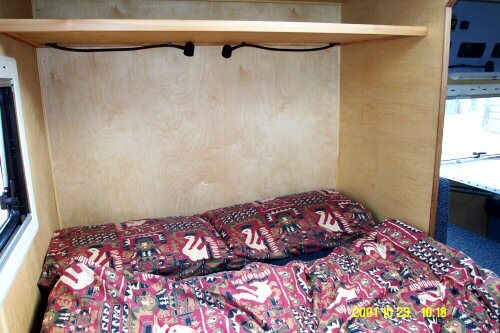 In order to utilize the area above the bed for storage two removable shelves were fitted to take five large plastic storage boxes. Consider more insulation on rear wall, say 60mm of X-trem not 30mm. 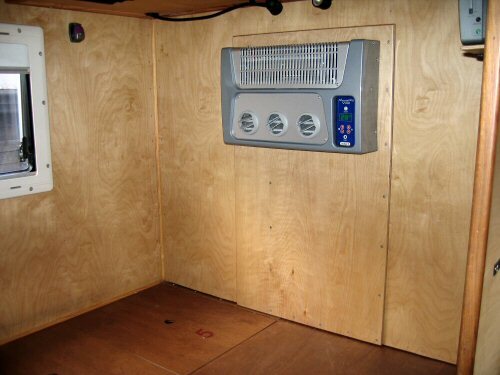 In July 2005 I added a very small air conditioning unit to the bedroom area of my Unimog campervan. In the past I had considered air conditioning but even the smallest available units required too much power to operate for more than a few minutes from batteries. 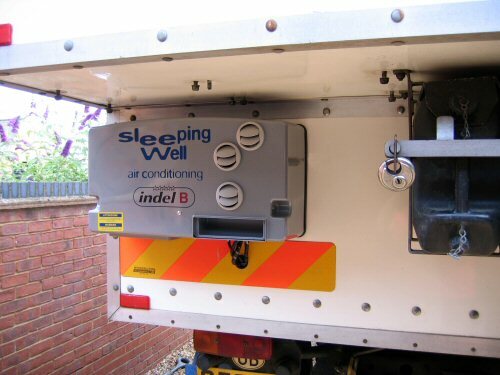 Recently very small air conditioners, intended for use in the sleeping compartment of trucks, have become available. 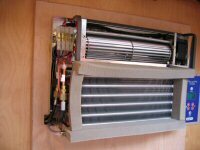 These provide only about 450 watts of cooling and consume around 6 amps at 24 volts. 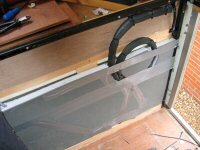 This air conditioning unit (Sleeping Well) is supplied already filled with refrigerant (R134a) and with three metres of very flexible plastic hoses that can be attached after the unit is installed. 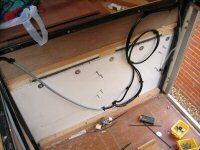 Once the valves on the condenser have been opened the hoses can not be removed without loss of refrigerant.